Samantha Ranvali hasn't slept in months. Haunted by memories of a brutal attack, she seeks an experimental cure with a group called Endymion's Circle. The doctors call her treatment a success-until it leaves her with visions of a violent murder strikingly similar to her own assault. The lines between sleep and waking blur even further when she discovers the body of a friend crucified upside down in a scene that seems to have come straight from her dreams. A recording of Bach's "Goldberg Variations" plays nearby-a sinister calling-card for a mystery that Samantha soon discovers spans over two hundred years. As the killings continue, Samantha and her former lover start tracking down clues to these ritualistic crimes, digging deeper into Endymion's Circle and Sam's own past. Every murder confirms that a dark curse has taken hold of her world. Every clue brings her closer to the certainty that she is the next victim. 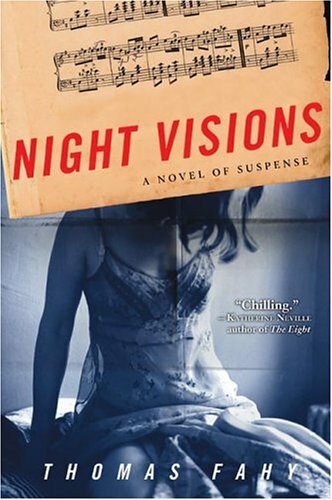 "Night Visions by Thomas Fahy is the surrealistic tale of a two-hundred year-old curse that wreaks violence on modern-day San Francisco. Looming behind each ghastly murder is the haunting refrain of Bach's 'Goldberg Variations.' Chilling." --Katherine Neville, bestselling author of The Eight. "Intriguing, disturbing, compelling. I couldn't put it down. Whatever you do, don't start reading it in bed. What a fine debut!" --John Case, best-selling author of The Genesis Code and The First Horseman.